The Manfrotto 595CLA Fig Rig Clamp is part of the 595B Fig Rig Camera Stabilizer. It consists of a camera platform with a threaded screw bolt, similar to Bogen's #577. The screw bolt has both standard 1/4-20 and 3/8" threads for mounting to the bottom of your camera. A bottom post locks the clamp into place, and acts as an additional handle. 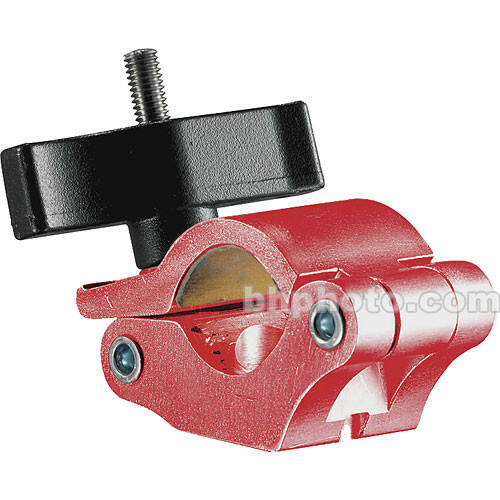 Box Dimensions (LxWxH) 4.7 x 3.6 x 1.7"
595CLA Fig Rig Clamp is rated 4.5 out of 5 by 4. Rated 5 out of 5 by Anonymous from Professional quality equipment The Manfrotto 595 CLA Fig Rig Clamp arrived as promised and it has proven itself as a great investment already! Looking forward to many years of continued use. It works perfect with my additional microphone used almost every time! Rated 5 out of 5 by Anonymous from Need a Couple More Works very well on the fig rig unit. I can see lots of uses for it in the outdoor video setup. Clamp it to just about anything as long as you have long xlr cables to get mics placed for good audio. Rated 4 out of 5 by Jerel from Fig Rig essential These little gems are essential for rigging lights, mics and other accessories to your Fig Rig. In fact, it's close to impossible to mount anything to the Fig without these. Rated 4 out of 5 by Anonymous from Does the job This clamp is doing what it is supposed to do, no more, no less. A welcome addition to the Figrig.